the home stretch……Nuby up next….novelty items on order….She came from Ohio to run,Lisa fine did!………. Cab Calloway runs 4th in fancy duck shoes…..Taylor,Vecchione newbies in the Sizzler winners circle..Tara G wins again………more below…..
To wit, Ginger Smith for serving as a course marshall at the end of the trail section~1.7 miles.To Eric Richard for directing the runners at the end of Depot Road,Bob Fogg for handing out finish place tickets at the finish.Ditto Mike Casner after he had run the 2.5 miler.Cazman also saved me at least another hour by picking up all the trivia posters , cones and stuff after…in the dark.Rick,Too!And Mr. Speedy Steve Palmer for writing down times for me twixt raindrops.Whew! And of course the highly versatile Lisa Ramey for registration, finish line timing and post race snack set- up and clean up!Matt Richard for registration and Parking Detail.Alas, Kurt Berna for guiding the 4 mile runners into the finish line area after he had done the 2- 1/2 mile and snagged second place silver.Team Engle( Kathy & William) for clean up.Huge!Merci.It is 8-10 hours of prep on race day each Monday(not including the time at the race).But if we don’t have the help, it wouldn’t go as smoothly.Execution is everything.It is all about details with tthe Sizzlers.Particularly when I have 2 courses to set up, mark, monitor,etc.Thank you!I am grateful and humbled by your cheerful efforts. Most runners opted for the longer route despite my dire warnings to scare them off. We have a rugged group.Ten ran the 2.5 mile while 25 completed the 4 mile route. The half mile trail section was nasty and I cleared it somewhat, but it was fairly treacherous. No broken bones, fatalities,or turned ankles.I marked the miles clearly, painted orange arrows ubiquitously at all turns and it paid off. Face the toughest conditions weatherwise and otherrwise, and it can only better you. All else will seem easy.Enduring temp. extremes,heavy rain , killer hills,rough courses will make you tougher mentally and sharpens you in every way.When an easy flat 5k run in perfect weather comes along, you will conquer it with ease.Also, there is a greater feeling of accomplishment afterwards.You build a bond with like-minded individuals.You could sense that last night in the esprit de corps. After I marked the courses,scurried back by 6:35,the runners were gathered underneath the overhang at the Depot, despite the torrent.They were game and gung ho.So 144 races and no cancellations now.Never.Tough gang, and all stayed for the post race awards, raffles, trivia, snacks/libations and to swap war stories. 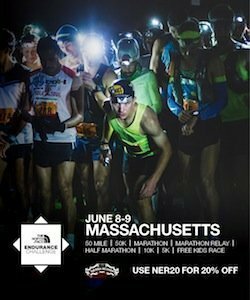 No mainstreamers,groupies, lemmings, or sheeple here.Those kind will a be at Boston, Beach To Beacon or Boilermaker following their heroes around, feeling comfy following the crowd. And spending all kinds of hard earned cash( or their spouse’s)on hefty entry fees, hotel rooms, expos,restaurants, and gas. In a lousy economy it isn’t the most prudent use of funds. Troy clinched the overall title with a 2nd place finish in the 4 mile.He has been with us for maybe nine Sizzler campaigns.Quiet, unassuming, tough, talented,cool and collected, Mr. French has been a joy to have with us , and we are glad he comes back year after year. Congrats to a worthy champion.You da man,Troy! Alex McGrath notched his 4th win of the year with a 23:04 on a wild night.He caught us by surprise.We had 2 different finish lines for the two races.It worked out fine.I timed the 2.5 mi with Lisa and Bob, then scampered to the other line with Steve Palmer assisting to record the places and times of the 4 milers.You da man, too,Alex! Tara Germond of Dublin is a regular now, with her third (or is it fourth?) victory of the Sizzler Season.She handled the 4 mile in a spiffy30:23.Runner up was Dana Whitney, who clinched the Lady Title at Oak Park last week. Kim Vecchione joined the Sizzler Winner Circle for the first time with her 21:58 for the 2.5 miler. Way To Go, Kim.Welcome to Victory Lane! Relative newcomer Rick Taylor,Hancock, captured the top spot overall in the shorter run with his 16:49 on a most dark and stormy night.Kurt Berna was runner -up in 17:09, then served as race guide and directed the 4 mile runners into the finsih line chute.Thanks,Kurt. Thanks To Jack Bowes, Deot Assn Prez, for allowing us to meet at the Depot. It all started here Year One,Race One in 1997,It is and will always be a special place. The year end novelty items are on schedule to be ready for our last race a fortnight hence. You will like them.As always, we don’t do T-shirts here.Never.Ever.If a path has been trod a zillion times,why would you want to go down it? The Broadpath leadeth to destruction, saith the Good Book. No thanks.Peer pressure and pseudo comfort in being with the masses,I guess, may just be too irresistible for many.If the majority go down one way,I purposely head the other.In everything. They are always wrong…..always.Anyway,you will like our item… but you will have to wait till ‘Customer Appreciation Night’ at Norway Hill in 2 weeks.That is called a teaser(not a taser). Next Monday is Race # 12.We make our final appearance at Nubanusitt Lake and the mighty tough 5 miler.I will give everyone a 7 minute headstart.If I don’t pass you,then you receive either a pint of blue berries,maybe Kimball’s ice cream cone g.c., or jar of honey.Not sure yet.But everyone will get something.Plus the usual stuff.I hope we get decent weather. But it matters to our hearty crew, they run anyway.My kinda people.Rugged and relentless. We had a visitor(Lisa Fine) from Ohio, a friend of Bill Springer’s, who made special trip while here …just to run with us,based on Bill’s recomendation.It was good to have her join us. She tackled the four miler, passed muster and earned her Sizzler stripes.We let her pick first from the Table Of Booty.Thanks for coming out, and we hope you come back,Lisa.Thanks,Bill, for putting in the good word.Bill’s the model of physical and mental fitness.Mr Positive! We had 12 containers of blueberries to distribute.I picked them in Troy, about 7 pounds maybe.Next weekend I plan to garner even more..so that everyone can enjoy them lakeside after The Nuby run.Feedback tells me they were well received.I’ll put them in little dixie cups on the snack table ,plus have 15 or 20 for prizes. Bring a friend or two.Let us see if we can exceed fifty runners each of the final two weeks. (and not love of money),long distance running in its purest form.